Here's a little public service announcement from your truly. I'm a well known ballbuster in my parts of the world. I love to have a laugh and joke around, but I can be pretty serious when I need to be or if a situation warrants it. In fact, I'm probably more serious than I appear. Probably. Unfortunately, even when I am, I still get those that have no clue and take me the wrong way. I'll say something intelligent or appropriate to the conversation, but staring back at me is always that one person ready to jab me in the arm, waiting for a punchline. I feel there's a lot of pressure to bring it all the time; to be the life of the party, if you will. "OH THANK GOD JENNY'S HERE! SHE'LL LIVEN UP THIS PARTY!" Seriously? Why do I have to? It's your party! I (stomps) don't (stomps other foot) want (stomps both feet) to. Why can't I just sit on the couch, enjoy a beverage, and talk to this nice lady with the killer handbag I must have? Whhhhyyy? Truth be told, I'm not an overly confident person and a lot of what comes out of my mouth is usually to take attention away from me. I'm known as what's called an Outgoing Introvert. Trust me, it's totally a thing. I can deliver in small groups where I'm comfortable, but throw me to the wolves and I'm sweating worse than the back of a toilet on a hot, summer's day. So I say this to you. If you know someone that's a happy-go-lucky person most of the time, just know they have off days too. Don't be too demanding on them. They're still human. Now if you'll excuse me, I have a pan of these bars calling my name from the closet where I can be found if you need me, but ONLY if you don't need me to hold your babes or liven up your next get together. If you need the latter, try back in twelve weeks. What? Can't take a joke? Preheat oven to 350F. Prepare a 9 x 13 baking pan by either greasing with butter or lining with parchment paper or foil, leaving an inch hangover for easy removal. 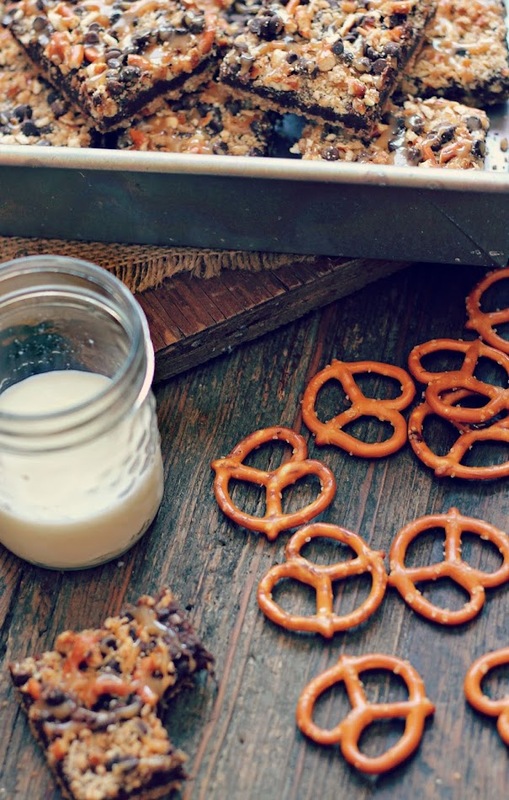 In a mixing bowl, stir together chopped pretzels, brown sugar, flour, and baking soda. Pour in melted butter and mix until all ingredients are coated. Press about 2 cups of mixture into prepared baking pan, reserving the rest from the crumb topping. In a heavy saucepan over low heat, melt chocolate and dulce de leche sweetened condensed milk. Add vanilla extract. Stir until mixture is melted and smooth. Remove from heat. Pour chocolate mixture over top pretzel crust, carefully spreading out evenly with an offset spatula. Sprinkle remainder crumb mixture over top chocolate. Toss on mini chocolate chips. Bake in the oven for 25-30 minutes. Remove from oven and place on wire rack to cool. 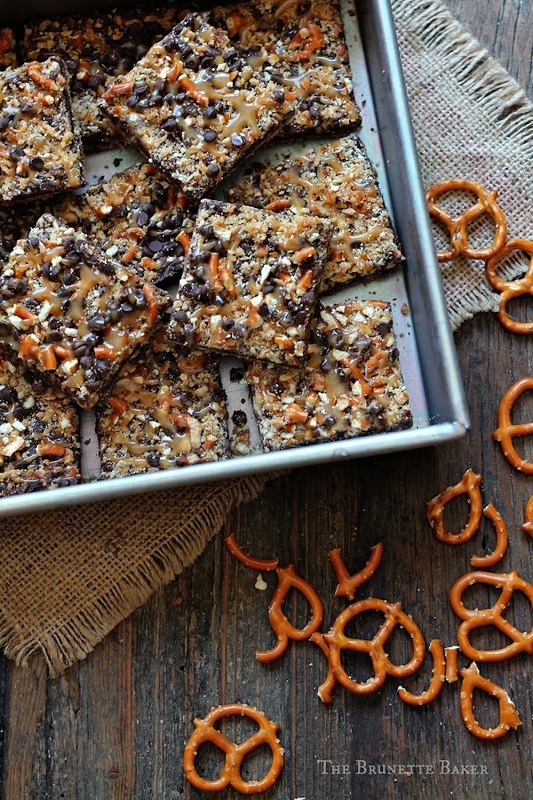 Toss on chopped pretzels. In a small heat-safe dish, microwave caramels until melted. Add in milk and stir until combined. Drizzle hot caramel over top. Allow to cool before cutting. These bars look heavenly! I completely get you about being on your game because I'm like that too. Sometimes being the nice guy is tough. It's amazing how many people can rely on someone for their happiness or excitement, isn't it? It can be very exhausting. I'll be pinning these! Found these on Pinterest. They're like a better version of Magic Bars. OMG. I'm so guilty of throwing my kids on friends and now I feel bad. Maybe these amazing bars will rectify my rudeness. LOL. These are EPIC. I'm making them ASAP. Can I use caramel sauce (as in ice cream topping) for these? OMG!!! These bars have all my favorite things in them! I'lll be making them tonight for sure! Thanks for making them! Pinning. BTW - I made your lemon tart for a bridal shower last weekend. It was a BIG HIT! Can I just say HALLELUJAH????? I love kids, but people constantly throw theirs onto me. I'm not joking. It happens all the time. I'm fun and very kid-like myself, but sometimes I just want to talk and have a beer with the adults. My sister is terrible for this. I love her and my nieces to death, but geez. These bars look incredible!! THESE. BARS!! I'm in looooooooove. OMG do these ever look good. They are jam packed with ingredients I love! I am featuring you this week, over at Simple Supper Tuesday. We would love for you to join us again this week, starting Monday night at 8pm EST. HOLY MACKEREL! I want the entire pan of these all for myself!